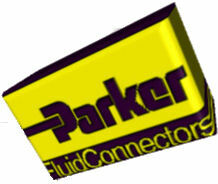 No Matter What The Application, Parker Industrial Hose Division Provides Proven Hose Systems Designed To Efficiently And Cost-effectively Handle Your Job Or Application. From General Industrial Hose Needs To The Most Specific Requirements Of The Specialty Markets, Our Hose Products Reflect The High Quality And Service You Require. our Industrial Hose Products Vary To Meet The Many Demands Of The Industrial Marketplace. These Include Requirements For Heat, Ozone And Weather Resistance, Chemical Resistance, Oil And Flame Resistance And Abrasion Resistance. By Choosing The Right Hose System, You Are Ensured Of An Individual Hose Assembly That Will Deliver Maximum Life, Safe Handling On The Job And Productivity. our Products Include Reinforced Rubber And Plastic Hose Capable Of Conveying A Wide Variety Of Materials Ranging From Water To Hazardous Chemicals. These Hoses Range In Size From 3/16" To 30" Id, With Pressures Up To 3000 Psi.